Some months ago, I came upon Shawkl's blog and she is documenting crazy quilting stitches. Actually, she's making them up and is using some basic templates. I got all excited and bought some quilters template plastic. My search for a small small hole punch so I could do up some of these templates, was unsuccessful. 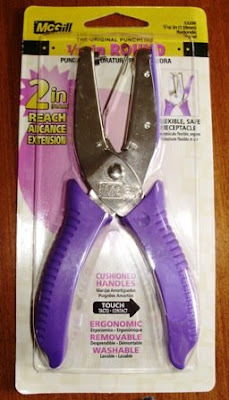 Today, I was at Michael's Craft store and I was browsing through the scrap booking department and since Shawkl has posted a new template in the past few days, the hole punch was top of mind again. 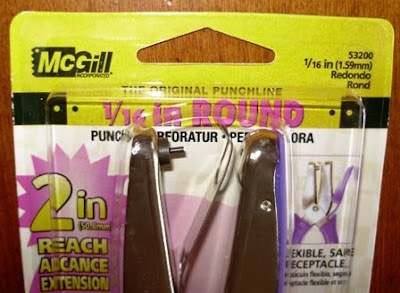 I asked a clerk for help finding the small hole punch. She was helpful and walked me to a few places around the store, and then we came upon it quite by accident. The young clerk said, "I didn't know we had those!" I was so happy to have finally put my hands on one. With my coupon it was about $7.00. See how small that punch is. The hole should be just big enough to put a pencil mark in. I'm now going to gear up again to make some templates and practice some of Shawkl's stitches. If you are handy to me, you can borrow it anytime to try it out. Just ring, ping, or knock.